Ask a futurist what the house of tomorrow will feature and she might mention automatic appliances and robot assistants. Ask a kid the same question and you’ll get answers that are slightly more creative, but not altogether impractical. 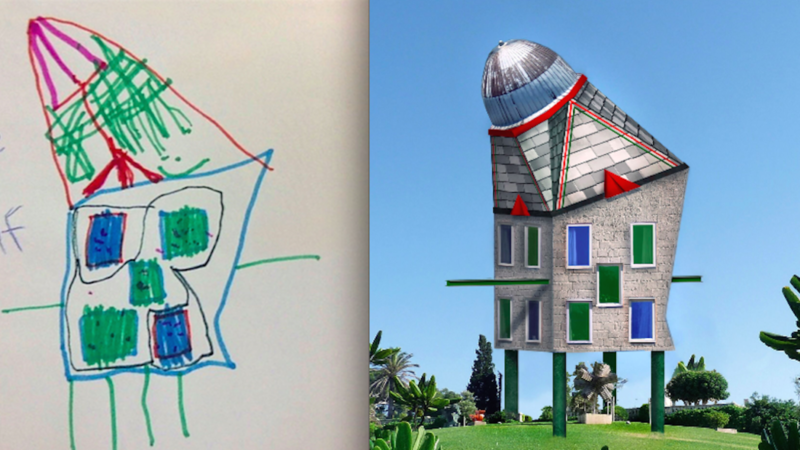 That’s what Made.com discovered when they launched Homes of the Future, a project that had kids draw illustrations of futuristic homes that served as the basis for professional 3D renderings. According to Co.Design, the UK-based furniture retailer recruited children ages 4 to 12 to submit their architectural ideas. The doodles, sketched in pen, marker, and colored pencil, showcase the grade-schoolers' imaginations. Paired with each picture is concept art made with a 3D illustrator that shows what the homes might look like in the real world. The designs range from colorful and whimsical to coldly realistic. In one blueprint, drawn by Ameen, age 10, a neighborhood of rainbow buildings and flowers float among the clouds. Another sketch by Ellis, age 7, shows a “home built to last” with titanium, bricks, a steel roof, and bulletproof windows. Some kids seemed less concerned with durability than they were with the tastiness of the infrastructure. Cherry-flavored bricks, candy windows, and a giant jelly slide were just some of the features built into the future homes. Sustainability was also a major theme, with solar panels appearing on two of the houses. Check out the original artwork and the 3D versions of their ideas below. All images courtesy of Made.com.